A classy and timeless urban riding shoe the Parlor is constructed from luxurious, full grain leather and incorporates a waterproof and breathable DRYSTAR® membrane for excellent all-weather performance. Dual density ankle protectors and soft padding make city riding and walking a pleasure. 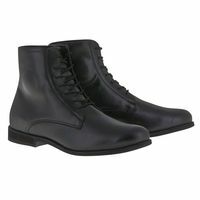 Full grain leather upper construction and lining is luxuriously soft. Water resistant Drystar® breathable membrane for protection from the elements, plus breathable textile interior lining throughout shoe. Medial side closure zipper lends to the shoeﾒs clean, understated style. Includes zipper garage and zip leather covers to protect bike from scratches and help keep zip in position. Shift pad inner foam inserts for a more durable contact surface with the bikeﾒs gear shift. Dual density ankle protectors backed with soft padding for comfort and support on both sides. Inner heel counter and toe-box reinforcement for support and protection. Traditional lacing system for convenient and secure closure. Alpinestarsﾒ exclusive oil-resistant rubber compound sole with new grip pattern design. Heel build of microporous layer plus rubber thread to reduce heel overall weight.